Upcoming workshop dates, details, registration links. *Studio will remain open until 5:00pm so you can complete any unfinished pieces. 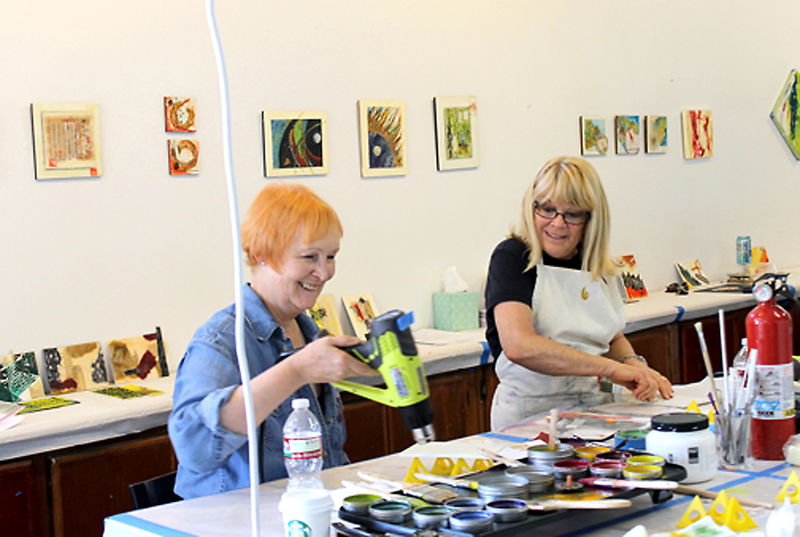 The BEGINNER Encaustic Workshop focuses on materials, tools, safe studio practices, collage, stencils, incising and transfer techniques. Demonstrations and lectures are followed up in the studio by blocks of time that allow students ample opportunities to experiment with techniques and create finished pieces. *OPEN STUDIO is an opportunity for students with encaustic experience to refine techniques and develop/finish work started in other workshops, as well as create new works utilizing all they learned in the Beginners and/or Intermediate workshops. Instruction will be available if needed. Class size limited to 8 students. No previous drawing or painting experience necessary. All about encaustic materials: paints, medium, supports, collage materials, etc. And, if we have time… even more! Students will leave with 2 to 5 completed works. In BEGINNERS and INTERMEDIATE workshops, demonstrations are punctuated with ample studio time to practice. For OPEN STUDIO students, demonstrations will be given by request. In ALL workshops, individual instruction is provided. *OPEN STUDIO IS AVAILABLE TO STUDENTS WHO HAVE COMPLETED THE BEGINNER WORKSHOP OR WHO HAVE EXPERIENCE WITH ENCAUSTIC PAINTING. Class size limited to 8 students. No previous drawing or painting experience necessary, but experience with encaustic is essential.